HBPOA has been involved in the creation of Bridgeview Park since its inception. Recognizing a desire to have a space for a children’s playground area, the HBPOA launched “Let’s Build a Playground Together” to fund the playground. Thanks to homeowners, property owners, visitors and businesses from across the country the equipment was funded and purchased. It was determined that the Playground would be part of Bridgeview Park. The property behind the water tower was purchased and the extensive permitting process was started. The Town applied for numerous grants to help fund the park, steered by the Parks and Recreation Advisory Board. After bulkheading along the Intercoastal Waterway was completed the playground equipment was installed along with two Bocce Ball courts. The Town won a Boating Infrastructure Grant (“B.I.G. Grant”) to provide matching funds for a transient overnight dock for boaters and restrooms to include showers and laundry facilities for boaters. The dock was completed in August 2016 and you can read about it here. A design for the restroom/shower/laundry building was selected and is currently being estimated. (Note: showers and laundry facilities would only be available to transient boaters, not the public.) The selected design is below. 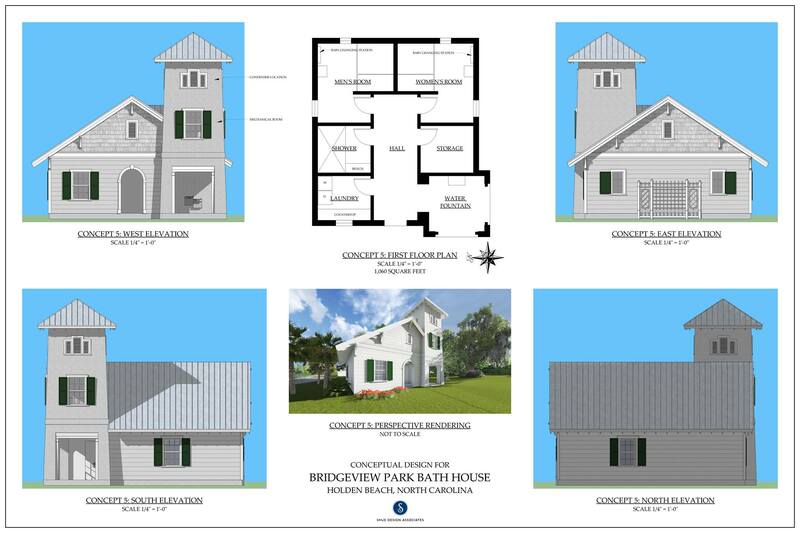 UPDATE: July 2015 Estimates for the bath house came in way too high. 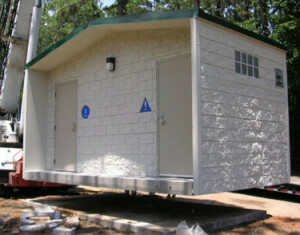 At the July BOC meeting the Commissioners voted to purchase and install modular bathrooms near the recycling facility. Here is a conceptual rendering of what they would look like. After the first attempt at a Parks and Recreation Trust Fund (PARTF) grant failed, the Board of Commissioners voted to fund the Multi-Purpose court from Town funds to move forward. A second attempt at a PARTF Grant was submitted in February and featured kayak launches, shade structures and a “splash pad” interactive water feature. A proposed site plan of the park is below. Different granting organizations make certain requests regarding site plans for property. 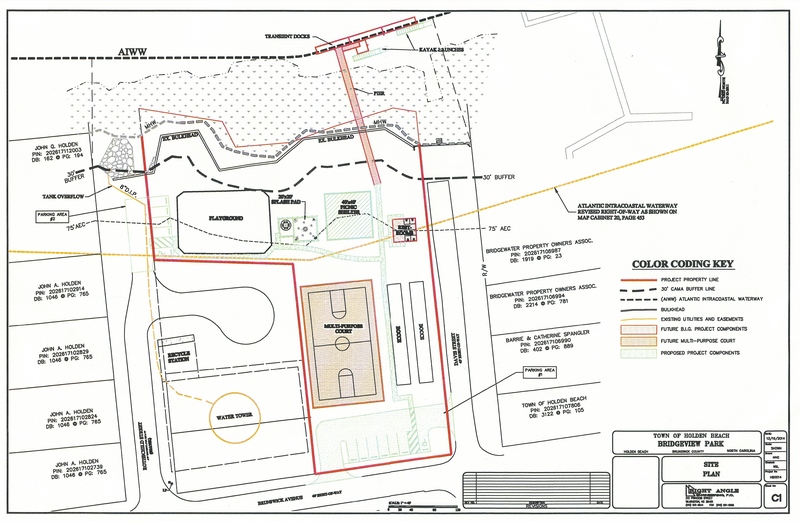 The above site plan is what was submitted with the PARTF grant to depict elements of the grant requested for funding. They have specific items they look for and request to be shown in this document. Other organizations may request completely different items for focus. Please be advised this is only the site plan for the PARTF grant.